Life As Seen In The Eyes Of A Sparrow: So You Play Guitar, Mister? If not busy with practical works like laboratory experiments, maintenance jobs, repairworks or building something up, I will be drowning in various mindgames - simulations, calculations, CAD drawings and other sorts of documentation-related tasks. Most of these things I did alone and still, and I have to keep clear of my works before night arrives. As a result, by the end of the working hour, I usually am going to be very tired from those mentioned. Therefore refreshments are crucial in making me feel energetic again. My usual resort, if not going out to the golf club, driving around (I like driving and country sightseeing) or playing basketball, running and working out at the campus reacreational area, is my room. Occasionally I will be browsing the net for some light reading or comic (I like Dilbert personally), or just tune into my personal music collection and find which songs suit the moment. Lately I'm finding my way back to guitar. I have been playing guitar since 2004, from which I learned by myself - from reading chords and tabs to plucking and strumming. 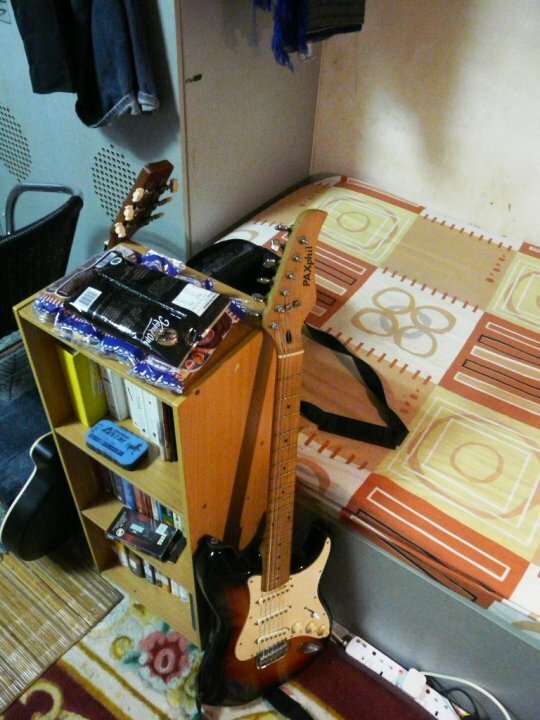 In the same year too, I bought my first guitar - an acoustic travel type with extra-bass steel-brass strings. From thereon I bought an electronic tuner unit, a capo, a number of picks, various string types (except nylon) and later on an electric guitar that came with a quite powerful guitar amplifier. I don't play guitar to impress, though sometimes it does, somewhat. It is fortunate too that my roommate is also a guitar player, from which he has too an acoustic classical type that creates beautiful tunes even when the all strings are played open. We occasionally play together, rotating the roles from rhythm to lead, and back again. Fortunate thing too that both of us love rock music, and more often than enough we will start from there, if not coming out with some random tunes and start composing right away. My recent likes into flamenco and plucking (I used to play those but not as regularly) often caused me to lie on my bed or with my back against the wall or in my chair slowly plucking each string in rhythm or sometimes with a combination of two or more. My favorite are Led Zeppelin's Stairway to Heaven, Seether's Broken and Fine Again, and some works by Akira Yamaoka. And simply enough, by doing so my mind seems to slowly calm down and relax. Although my roommate and I did some performance back then, both of us think that our time is over for such things, though our love for music gains by the seconds. For now, we prefer staying in the room playing the instruments, accompanied with regular milked coffee and rich-tasting tobacco rolls while we scar our fingers from raw-sounding metal strings. We just feel better that way. You should play guitar too, people, but beware of the intentions. Oh you'll get me. My electric and acoustic, side by side.